Are you the type who's been fantasising since you were a little girl about pulling up to the ancient church in a gilt carriage pulled by six white horses? Or are you a tomboy speed freak who'd like nothing better than to roar up to the ceremony on a powerful motorbike? Here's a rundown of the possibilities to get you from 'Let's go' to 'I do', and how to get your hands on that perfect vehicle. Begin by considering the number of venues you'll need transport to get to - if you're having the ceremony and reception in different places, for example, don't forget to book transport between the two. You may also want to organise vehicles to get you to your first-night hotel and to the airport when you depart on honeymoon. Timing's going to be all-important if you don't hire the vehicle for the whole day. Make sure you know what time you're going to want picking up and dropping off in different places, and ensure there's a system in place to let the driver know if you're running early or late. Your guests may also require transport to the ceremony and to and from the reception, particularly if they're planning to drink enough to put them over the limit. Consider a few larger vehicles such as minibuses or coaches for this purpose - there's no point ruining your limo ride by having everyone squeeze in with you. Horse-drawn carriages are perfect for the old-school romantic couple who are eager to have the ideal traditional wedding - elegant, eco-friendly transport that's never going to run out of petrol at the crucial moment. However, their suitability depends on the route from your starting point to the ceremony. Consult the hire company about the length and hazards of the trip - any more than a couple of miles will take a long time, while steep hills and traffic-choked roads are pretty unfair on the horse. If you're really set on it, but can't be within two miles of the church beforehand, consider meeting the carriage at a point further down the road and travelling on to the church in style. Vintage cars add a touch of class to your trips and are bound to excite the more mechanically-minded members of the party. An open-topped model might make you feel like a Forties movie star, but bear in mind that any wind is going to damage your hairstyle - to say nothing of the possibility of rain. Really old models can only travel at limited speeds, so only consider them if you're within 20 miles of your venue. A limousine's always been the last word in luxury, often contains all manner of extras in the interior - from bars to plasma TVs - and has the added bonus of being able to seat far more people than a conventional car. 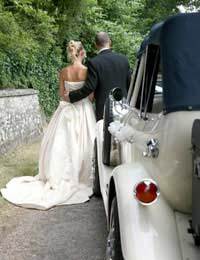 They are expensive to hire, however, so if you're only thinking of using it to transport the bride and groom down the road to the church, consider whether you're really going to need a telly for the trip. If you don't give two hoots about tradition and want to try a different type of vehicle - be it a motorbike, glider or rodeo bull - make sure your wedding outfit is compatible with the relevant safety equipment. Elaborate hairstyles will suffer under helmets or hard hats, while long skirts could prove dangerous if they're left to dangle close to moving machinery during the trip. Gorgeous vehicles can be made to look that bit more festive with the addition of flowers, coloured ribbons or any personal touches you fancy. Most companies will be happy to add ribbons in the colour of your choice as part of the cost of hire. Find out what other extras your preferred company offers - perks range from liveried chauffeurs to champagne on the way to the reception. If what you want isn't offered as part of a wedding package, ask if it can be arranged for a fee.